Learning doesn’t only happen in a classroom. We believe it also happens while out and about, where learners are able to see, engage and interact with history, culture and science. This is why we offer a special group rate for schools hopping on the red bus on Wednesdays – you can save up to R1 500 per bus! Until 30 September 2018, we are inviting school tours to hop on the red bus at our special rate, only available on Wednesdays during school term. 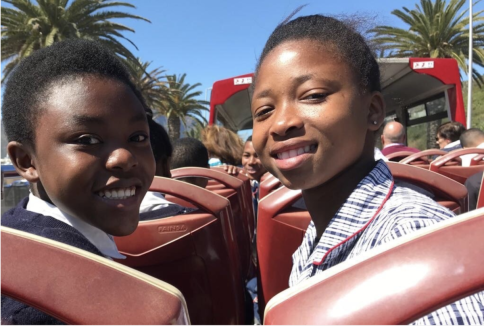 This means that up to 60 learners can hop on the bus, chartered to them from 8am to 12pm, explore Cape Town and its attractions AND be home in time for lunch. As the rate applies only on Wednesdays, slots are limited and filling up fast – book your school tour today! The City Tour to Table Mountain is our flagship tour in Cape Town. It provides the easiest and most convenient way to visit the Table Mountain Cableway and it offers a great introduction to the City Bowl, as well as Camps Bay and the Atlantic Seaboard. The Mini Peninsula Tour circles the back of Table Mountain, letting you take in the scenery on its southern slopes, including the beautiful Kirstenbosch National Botanical Garden, exquisite Constantia winelands and charming Hout Bay, before heading back via the Atlantic Seaboard on a picturesque coastal drive into the city centre. Simply email [email protected] or call us on +27 (0)21 511 6000 to make a group booking. Please note the special is subject to availability and may only be redeemed on Wednesdays during school term until 30 September 2018. You will meet at the City Sightseeing ticket office at the V&A Waterfront at 8am and hop on your designated red bus. Kids, teachers and parents can put on their complimentary earphones, sit back, relax and learn about the Mother City as you drive through it. Our on-board audio guide (available in 15 languages, plus a special kiddies’ channel) provides information about notable historical and cultural points of interest along the way, an opportunity to learn while enjoying the fresh air. You can choose either our City Tour to Table Mountain or the Mini Peninsula Tour, and decide where you want to hop off and how long you’d like to stay there. Explore Kirstenbosch, go up Table Mountain or simply enjoy the beautiful coastal drive between Hout Bay and Camps Bay. You’ll return to your starting point at the V&A Waterfront again at 12pm after four hours of fun on the bus. From here, we highly recommend a visit to the Two Oceans Aquarium, or try the V&A Waterfront Harbour Cruise – you can explore Cape Town by bus AND boat!